From day dot, I have used a sharps bin. Without fail. It is for the safety of others, more than just myself. I keep it up high in the bathroom on a shelf, well away from the tiny hands of my precious toddler. I also take a small one away with me when we go on holiday / away for the weekend. It is so important and if you don’t currently do this then I urge that you do. The idea of just throwing it in the bin as general waste and someone getting a needle stuck on them and the sheer terror and panic that for them and their families would go with that, is a horrible thought. I have heard of people who don’t use them. I have seen conversations about it on social media and I think it is irresponsible. Sorry if this offends you but just think about it. How would you feel if you or your child / husband / wife / family member, was putting something in a bin, or picking up a plastic bag to put in the bin and there was a used needle in it, which pricked them and caused them pain / injury. Who’s needle was it? Was it contaminated with something awful that would effect their future health? All the questions, all the worry, and all because someone didn’t take the simple responsibility of just getting a sharps bin. You also have to think about those who are vulnerable, those who could find a needle / used insulin vial and use it for drug use. Also, I don’t know if you have ever caught a needle under your nail or in your finger but it is darn painful and not something any one deserves. Needles can cause injury to others because they are sharp and a penetrating injury with a used sharp can transmit a wide range of infections. Once they’ve been used, they also carry fluids from your body, such as blood. Used needles can carry infections, such as human immunodeficiency virus (HIV), hepatitis B or hepatitis C. A used needle which is contaminated like this can pass an infection on to other people. Where do I get a sharps bin from? You will need to get a special sharps bin from your GP, this is available on prescription (FP10). You must collect this from the chemist, ask them to assemble the box. When you have filled your bin, you must get a new one from your GP. You can also get them from most insulin pump companies which usually offer free delivery back to them. They usually ask you over the phone if you would like to receive one along side any pump equipment you are ordering. If all else fails, you can buy them online, for as little as £1. A sharps bin is the safest way to dispose of contaminated or used sharps at home. It protects you and any other members of the family and any people involved in the removal of waste from your home. Keep your sharps bin in a safe place while it’s in use, so that it’s not a danger to other people. The lid of the sharps bin must not be removed once the bin contains sharps. Once you have put a used needle in your sharps bin, do not try to take it out again. Dispose of needles and syringes as a single unit i.e. don’t dismantle them before putting them in the sharps bin. Sharps bins must not be filled above the full line. Do not force sharps into a full bin by pushing down with your hands. When your bins are 2/3 you must seal & label the container and use another bin. Full bins must be securely stored while awaiting collection. Where do I dispose of my sharps bin? 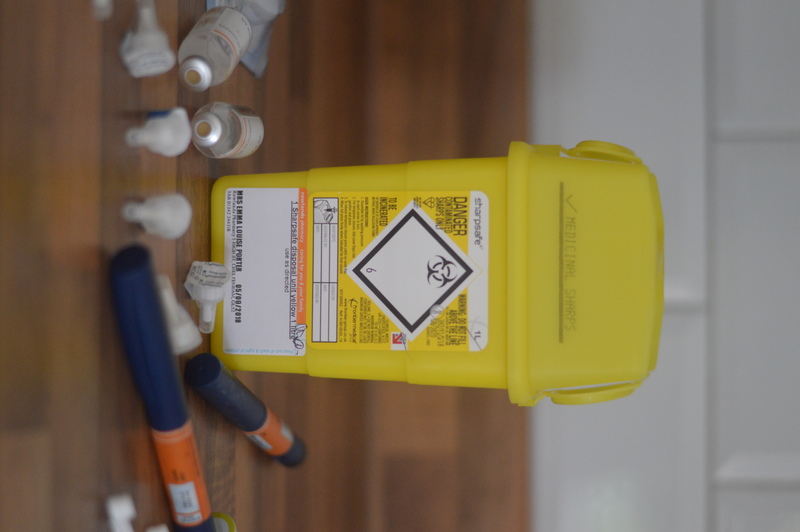 Your sharps are classed as clinical waste, which means that special arrangements apply to their disposal. Using a sharps bin protects everyone and makes sure the waste is treated and disposed of safely. Household recycling centres do not accept sharps bins (which is labelled on their websites as “hazardous” clinical waste) as they pose a significant health risk and need to be disposed of safely. When your sharps bin is full (up to the maximum line, about 2/3 full), contact your local authority or look on their website, it will explain on here whether it is collected from your home or whether you take it to your local pharmacy. In some cases you may need to return your box to your doctors practice. In Cheltenham, there is a list (on the borough website), listing all the pharmacies that are currently included in the syringe ‘take back’ scheme. So I just pop mine in to my local one a 5 minute walk away, I usually do this when picking up a prescription (once a month), so it is just routine. Simple. Please do add any advice for others in the comments below!